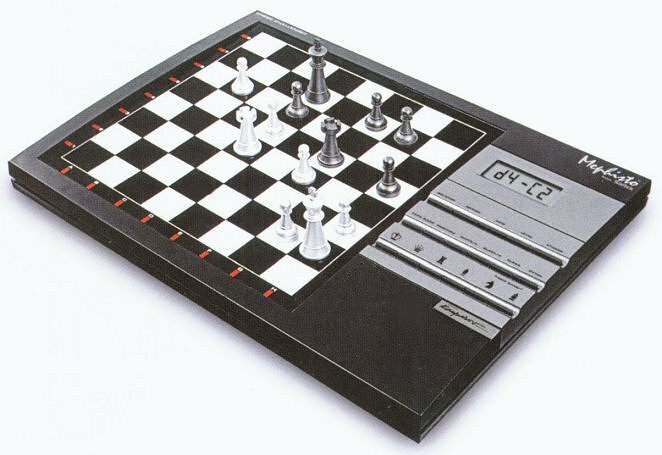 The Saitek Kasparov Mephisto Chess Challenger Chess Computer may very well be the ultimate Chess playing challenge. This powerful Saitek Mephisto Chess computer game is designed for expert level chess players. It will challenge the most affluent and highly skilled chess players. The Saitek Chess Challenger's algorithms were designed to test your every move and sharpen your game technique. The Chess Challenger contains an extensive library of openings and grandmaster moves; you will not only be challenged but will also have the opportunity to learn from the experts first hand. Some of its program features include: 64 Playing levels, including Normal, Infinite, Tournament, Blitz, Fun, Mate Search, Training and Adaptive. An Info Mode lets you see inside the computer’s mind, while Coach Mode provides capture alert and tactical alert warnings. Study Mode lets you learn from the experts by replaying a vast number of famous grandmaster games stored in the chess computer's memory. The 50-move Take Back lets you experiment and improve your game. You can play against the computer or a human opponent, and set up positions to experiment and learn. Also provides you with hints to help you improve your game. The Saitek Challenger has a pressure sensitive Chess Board, LED lights that display the next move, and a 5 digit LCD Display. It also stores unfinished games in memory so you can quickly pick up game play from where you left off. A built-in storage compartment stores all chess pieces and supplies. The computer runs on batteries or outlet power and includes an AC/DC power adapter.